5 free digis from Di's Digi Downloads. Isn't that enough to get you excited to play along. 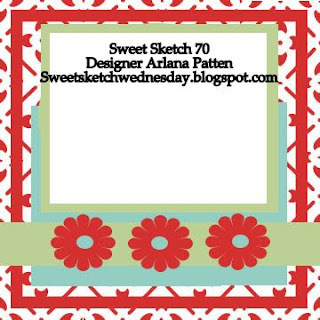 This is the Sweet Sketch that you will use for this week's card! Oooo Judi, how sweet is this!!! Love that image and the crystal effects on the ornaments. Your ribbon and snowflakes are fab too. 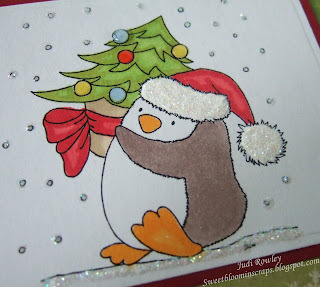 What I now have to go look for now is the evergreen embossing folder, I love it!!!! We had a big storm here in Phoenix and I don't have internet access at home. I'm at the library now, and I can't get to my blog to upload today's post. I'm sorry, and I'll keep trying. What a great card! 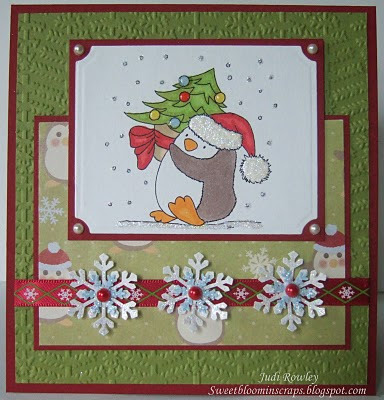 I love the penguin and how your snowflakes match the ribbon! I am so happy to see that we picked the same image - we are just so smart ;) I love the glossy accents on the tree and your coloring looks really, really nice! Love the embossed background. Such a cute card! So adorable and I love all of the sparkle! Yours was the only website I could get to yesterday to let you know about the mess the storm made here. I'm sorry I was late. You and your family are in my thoughts. Judi, this is just so cute!! I love the embossed background, is that a new folder? Your DP matches the image so well, and I love how you added baubles for the ornaments. Great card! Hi Judi! Beautiful card this week. I love the embossed Bg & the shining baubles on the tree are fab!